The final sentence in the Declaration of Independence reads, "And for the support of this Declaration, with a firm reliance on the protection of Divine Providence, we mutually pledge to each other our lives, our fortunes, and our sacred honor." America, now it is our turn to do the same: our freedom is at stake. It's time for the average American to stand up and defend freedom! Seriously, it's now or never. Time is not on our side. But, with hard work, determination, and God's blessing, we will win! America has a rich history of victories. Americans are winners. Let us boldly and confidently fight for freedom and beautiful America! Resist the urge to trust the media. Understand for yourself why we became a country. Far too many Americans have no clue what the Declaration of Independence even says. Take time to read it. It's not a long document and it is a fascinating read. The Declaration of Independence was a statement adopted by the Continental Congress on July 4, 1776. In the thralls of the American Revolution, it announced that the thirteen American colonies regarded themselves as independent states (no longer a part of the British Empire). Primarily written by Thomas Jefferson, the Declaration of Independence details grievances against King George III and Great Britain regarding their abuse of power. Click here to read the Declaration of Independence. Read and re-read the U.S. Constitution until you can get a basic grasp on its truths. On September 17, 1787, eleven years after the Declaration of Independence was written, the Constitution was adopted by the Constitutional Convention in Philadelphia, Pennsylvania. Our Constitution has provided a stable, practical guide for governing. The underlying principles of the Constitution were gathered by the delegates from years of careful study of governments and political thinkers, and also from the failed lessons learned from the failed Confederation. Limited government, separation of powers, and checks and balances are major themes in our Constitution. The Constitutional framers forged a working balance with these principles that has provided our country with liberty, order, and an enduring charter. Click here to read the U.S. Constitution. Discover, claim, and defend your rights! Many people do not realize that the Bill of Rights consists of the first ten amendments of the Constitution. James Madison introduced these amendments on July 21, 1789 and they were ratified on December 15, 1791. The Constitution and the Bill of Rights made liberty secure. (i.e. The First Amendment insures five freedoms: religion, speech, press, assembly, and petition.) The amendments illustrate the principle of limited government. For example, Congress cannot establish any church or denomination as a state-sponsored church. People are free to worship as they choose. Read the Bill of Rights here. Be able to answer this: What did the Founding Fathers intend? Acclaimed by Thomas Jefferson as 'the best commentary on the principles of government which ever was written," the Federalist Papers make a powerful case for power-sharing between state and federal authorities. The Federalist Papers were written by "Publius" the pseudonym for Alexander Hamilton, John Jay, and James Madison. They were a collection of 85 articles promoting the ratification of the U.S. Constitution. The Federalist Papers detail the intent of the U.S. Constitution as seen by the Founding Fathers. Read the Federalist Papers to learn what was thought and believed by the men who help shape our country. Oh say, can you sing the National Anthem? "The Star-Spangled Banner" is our nation's National Anthem. The lyrics come from a poem written in 1814 by a 35-year-old lawyer, Francis Scott Key. He was inspired to write it after watching the bombardment of Fort McHenry during the War of 1812. "The Star-Spangled Banner" was officially declared as our National Anthem in1931. Learn earn the lyrics of the National Anthem. As a way to show respect for our country and freedom, always stand and place your right hand over your heart. Click here to watch Stacie Ruth sing our National Anthem. Pledge allegiance to the flag! The Pledge of Allegiance of the United States is a way for citizens to express their dedication and love for their country and freedom. Through the years, it has been modified four times. Most recently, the words "under God" were added in 1954. The introduction of "under God" in the 1950s was done during the Cold War, as a way to differentiate the U.S. from the concept of communist state atheism. Here is the Pledge of Allegiance: "I pledge allegiance to the flag of the United States of America, and to the republic for which it stands, one nation under God, indivisible, with liberty and justice for all." 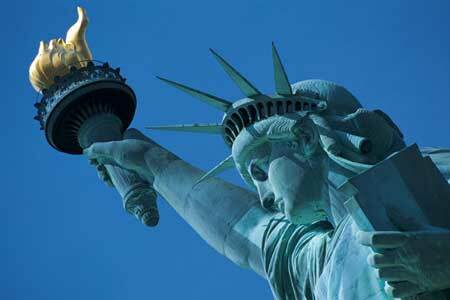 Pass the torch of liberty. Take time to teach your children and grandchildren about the greatness of our God and country. Without you, how will they learn? Your personal touch, time, and attention are effective in encouraging children to love faith and freedom. No school, group, or TV/computer program can replace the impact that you personally can have on our next generation. Visit your local library or bookstore to find resources about our country, government, and history. Have your kids meet our nation's heroes in your community and explain for how they fought for your own freedom. Put your guard up about too much government. Be aware of current events. Be aware about what is happening in the news and in the federal and state legislatures. Do not assume that government programs with nice sounding names are safe and for the good of the people. (Sometimes the most dangerous bills have great sounding titles.) It's easy to keep up with current events through the radio, TV, newspapers, and online tools. It's simply up to you to take advantage of those accessible resources. Voting does count! Over 50% of eligible voters do not make the effort to vote. Don't be part of that group. It's easy yet very important to vote. You do not need to stand in line at the polls. Instead, vote via an absentee ballot. Contact your auditor's office to request an absentee ballot. In fact, throughout history there have been many elections when only a hand full of votes made all of the difference. Visit historical landmarks to make our history 'come to life'.It reinforces the fact that our past is real. For example, visit your state capitol building, presidential libraries, battle sites, or any other historical landmarks in your area that interest you. Seeing places were our government works or where history happened makes history and government text books much more interesting, real, and applicable. Lawmakers serve you. Request meetings with your lawmakers. Many state and federal legislators regularly tour their constituencies and hold town hall meetings. For example, it is widely know that in Iowa, Senator Chuck Grassley tours all 99 counties every year. Make the time and effort to meet with your public servants to hear what they have to say about current news and legislation. Our leaders need to hear from you. Pray for our nation. America was founded by God-fearing men and women. 2 Chronicles 7:14 says, "If my people who are called by my name humble themselves, and pray and seek my face and turn from their wicked ways, then I will hear from heaven and will forgive their sin and heal their land." Prayer is powerful. Learn more about our prayer group at http://www.prayingpals.org/ . America must continue to proudly hold the torch of freedom for all to see. May we uphold and hold dear what is inscribed on the Statue of Liberty: "Give me your tired, your poor/Your huddled masses yearning to breathe free." 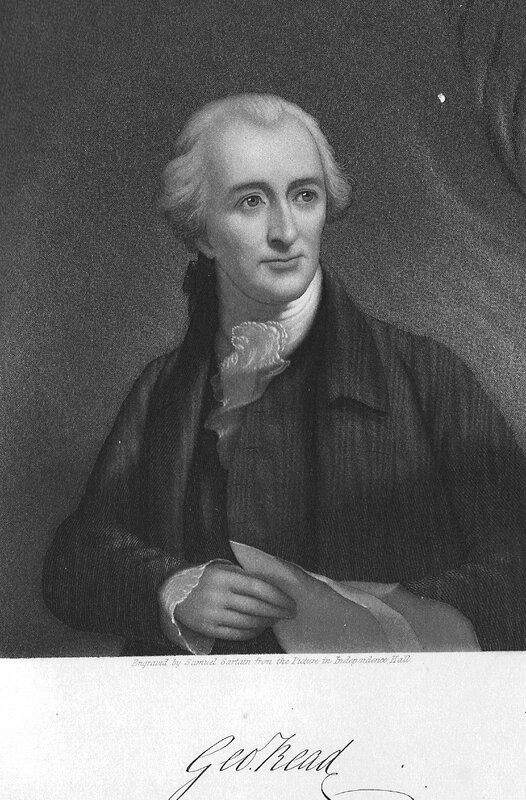 George Read (September 18, 1733 - September 21, 1798) was an American lawyer and politician from New Castle, Delaware. He was a signer of the Declaration of Independence, a Continental Congressman from Delaware, a delegate to the U.S. Constitutional Convention of 1787, President of Delaware, and a member of the Federalist Party, who served as U.S. Senator from Delaware and Chief Justice of Delaware.